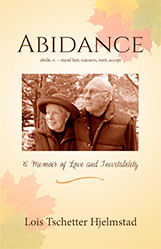 Abidance: A Memoir of Love and Inevitability is the story of the challenges Les and I faced as we entered the parallel universe of the Old-Old. It also tells how we managed to stay crazy-in-love through it all. Les had indeed recovered well in the past, but he was ninety-one now. The frequency of his current mishaps frightened me. He continued to say that it was okay, he would be okay, but I saw his unsteadiness as a problem. Each hot summer day, as July wandered into August, I clung to my stoicism, my pragmatism, doing whatever needed doing, falling into bed in sheer exhaustion every night. It was as if Les were climbing a tall ladder and I held it, hoping to keep it stable. I sighed. I have spent so much time trying to protect Les that it was truly a moment of grace to open the floodgates, to share my blackest state of mind, to have him understand and comfort me. He is my husband. He remembered that he is. He did what only he can do. Get a signed copy by ordering directly. Contact me at lois.hjelmstad@gmail.com.